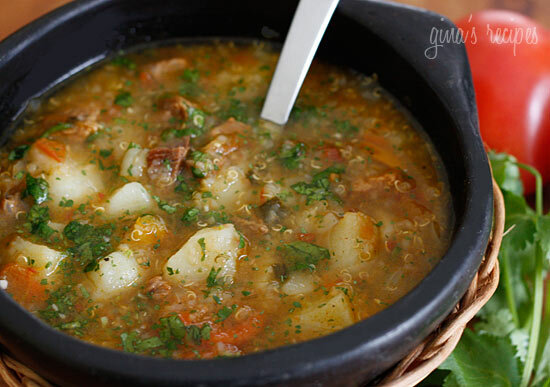 For the meat and potato lover, this hearty quinoa soup is for you. A nourishing one pot meal, typically served with aji and avocado on the side. Hearty soups like this are exactly what I love about South American cuisine. More of my favorites are Chicken and Cavatelli Soup, Chicken Soup with Spinach and Whole Wheat Acini Di Pepe, Stuffed Pepper Soup and Left Over Ham Bone Soup with Potatoes and Cabbage. , Trader Joe’s and even at your local supermarket. Click here for the recipe to cook basic quinoa. By now I don’t think I have to tell you just how much I love Latin American cuisine. It’s the ultimate comfort food to me, so I am happy to share some wonderful South American dishes with you. This dish was adapted from Laylita’s Recipes, her blog features many wonderful Ecuadorean dishes. which is perfect for making a pot of beans. Lot’s of you are asking me which I own, click here to see. Saute oil in a large pot, add scallions and garlic and sauté until soft over medium heat, about 3 minutes. Add tomato, cumin, sazon with achiote, 1/4 cup cilantro and cook another 2 minutes. Add beef, water, bullion, carrot, bell pepper, salt and bring to a boil. Cover and simmer on low about 1-1/2 hours, until meat is tender. Add remaining chopped cilantro and serve. 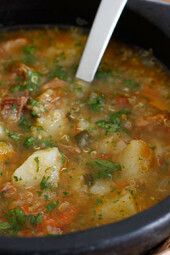 If using a pressure cooker, cook soup with meat 45 minutes, add potato and quinoa and cook 10 minutes more. AnonmousThis is Really my name and my e-mail girl.I have to tell you that I love your cooking work for a young woman.please let me join again because I am teaching a young class about what good things there are to cook in the world today.E-mail me back if I have did something wrong please. 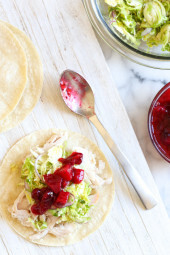 Made this tonight in the instant pot and it is delicious!!! We cooked the quinoa on the side and added it in afterwards to keep this dish more soupy rather than stewy. Would make again! What is the point difference if I use ground beef instead of beef tenderloin? I’ve made this three times… it’s perfect and delicious for this fall weather. I love the flavor combo. I had no reason to other than I had some cauliflower I needed to use… but I added it at the same time as the potatoes… and when the soup was done I took the cauliflower out and blended it (had to hide it from picky eaters!) and added it back. Didn’t really change the taste… just the color of the soup. 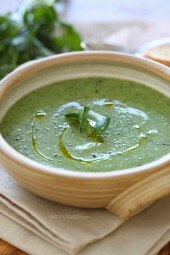 Skinny Taste is my favorite place to go for recipes when I need a for sure great dish. Thank you! I am missing the Pressure Cooker part of this recipe. It looks like it takes a lot longer than the pressure cooker. Is there a part of the recipe I am missing? No, there were not actual PC directions on there, just a comment that you could cook it in one if you wanted to. If I use a pressure cooker, do I do the quick release before adding the second batch of ingredients, or natural release? Thanks! Did I miss the instructions for cooking this dish in the pressure cooker. I have an IP. Thanks! Beef Bullion. Ok, HOW MUCH beef Bullion? Fail. I've had quinoa sitting in my pantry for a month looking for the perfect recipe to use it on. Thank you! Made this last night! So good. Added a little Slap Ya Mamma seasoning for an extra kick! I was confused by the bullion too…which is why I am on comments. I'm by no means the world's greatest cook, but I'm confused by the proportions, like the 2 Tbsp of yellow pepper (waste the rest?) and the 12 of beef, which of course it's impossible, at least around here, to find that small of a package, so I plan to double it? But not sure how much bullion? I did make the chicken/butternut/quinoa soup/stew, and it was flat out awesome, one of the best things I've ever made! So I am anxious to try this one out, but would like to know about the bullion going in. The recipe calls for beef bullion, but doesn't say how much or what type: cube(s) or powder. I assume not liquid, considering how much water is added. I made this soup a few weeks ago and it is FANTASTIC!! Just curious to know why you suggest simmering it for 1 1/2 hours and Laylita's recipe says only 40 minutes. I'm making this soup as we "speak" and cannot wait to eat it – hence my silly question! I thought this recipe might be a bit thicker and spicier than it turned out. I improvised a bit with the pressure cooker and just put everything in at the beginning (after the initial sauteeing/browning bit)… nothing was mushy and everything was soft, but it was a bit more liquid-y than I expected and it was quite a bit milder than I expected. I might have used a little less cilantro than you did but that was really the only change on this recipe, though I guess my sazon didn't have achiote (as I didn't find any) but rather had turmeric. Any suggestions for making it a bit more flavorful? More sazon or something else? Really wish you would put more pressure cooker recipes on here. I love mine! Just out of curiosity, what gives this such a high fat content per serving? Can only be the beef and the olive oil … but im guessing the beef is the culprit because of the way its calculated for WW purposes. I made this a couple weeks ago on my kiddo was not happy that I didn't double it. I'm making it today and I'll be sure to double. I also have Crockpot Chicken Enchilada Soup going in both my crockpots. Can i just put the quinoa in with everything to cook? How do you cook quinoa in the crockpot anyways?! Just tried this yesterday and it is my new favorite beef stew recipe! Didn't have the sazon so subbed paprika as suggested above. I upped the quantities of everything a little and also added string beans (cut into bite-sized pieces) and corn cut off the cob. 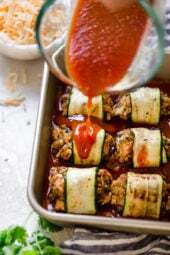 Hearty, tasty, and healthy, love it! Just felt compelled to add that this recipe is amazing and has become a weekly staple in my house. Thank you, Gina! Hi there, I can't get the spice here in Ireland. what can I Sub it with? GINA! You are amazing! . I absolutely love how you add the Calories as well. 🙂 Thanks. With this one I had to double it up. Because with every meal I make I never have enough for lunch! So I need some left over. I know this is a stupid question but even as I double everything the calories wouldn't change per serving right? So GOOD but I did the same thing with the Quinoa – put 1 cup uncooked instead of 1 cup cooked. CAme out like a stew, but still good. Left out the cilantro, put a couple of extra carrots for the kiddos, used beef broth cuz I didn't have a boullion cube – the rest the same and delicious! LOVE Gina – she rocks – makes my life so much easier! We don't really eat red meat so I subbed the beef for chicken and used chicken broth instead. It's cooking on the stove right now and smells divine. The sample I just tasted is very promising. So happy I found your site, this is the second recipe of yours I have made this week and it is only Tuesday. I hated this. I couldn't even finish a couple of bites of it. My husband said it "was decent," but not something he wanted to include in our rotations. I don't think I messed up the recipe – I cook your recipes daily, so I'm used to following them & even adding my own twists sometimes – I think it's just the combination of flavors that didn't work well for me. Cooking with cilantro is always a tricky proposition with my taste buds, this just happened to be one that didn't work out for me. I wanted to love this, it sounded like excellent comfort food. It just wasn't for us. Just a thought, but did you happen to forget to rinse the quinoa? It can taste really nasty and bitter if you don't. I really can't imagine ANYONE not liking this. I make this soup at least once every 2 weeks now. My family loves it! Made this for the third time tonight and again it was delicious! THANK YOU for making healthy eating, yummy eating! I just got everything to make this soup but them realized that the sazon I purchased is saxon tropical and not with achiote. I'm not sure what the difference is–do you think I should not use the one I purchased? Thanks! !